Up today, another concept from Kahneman: The evaluability hypothesis. This means that we need a way to evaluate the meaning, value, or benefits of something, to understand it. Kahneman cites the example of people asked to suggest a price for a used music dictionary. One group of people evaluates a book in like-new condition, with 10,000 entries. Another group evaluates a book with much more wear, but 20,000 entries. The first group puts a higher price on their book than the second book. The condition of the book trumps the number of entries, because by itself, the number of entries is meaningless, while the condition of the book is meaningful. When the groups then get to compare both books, they adjust their valuations and decide that the dictionary with more entries is more valuable. Once they can compare the number of entries, that attribute becomes meaningful. Unfortunately, even when we try to discuss value in our sales proposals, we often do so in ways that run against the evaluability hypothesis. Technical specifications are often meaningless, especially to the financial buyer. I’ve seen proposals touting “hundreds of PhD-years of research.” What does that mean? Will it mean better results for me than a competitor with fewer (or more) supposed years of PhD-level research? It might sound good, but it’s hard to assign value to it. Here’s an example from the news, rather than a proposal, but the example will be easy to understand, regardless of your industry. These charts of from Business Insider’s article: America’s Stunningly Overpriced Healthcare System in 2 Charts. Is this compelling? Maybe. Depending on the details of the study. 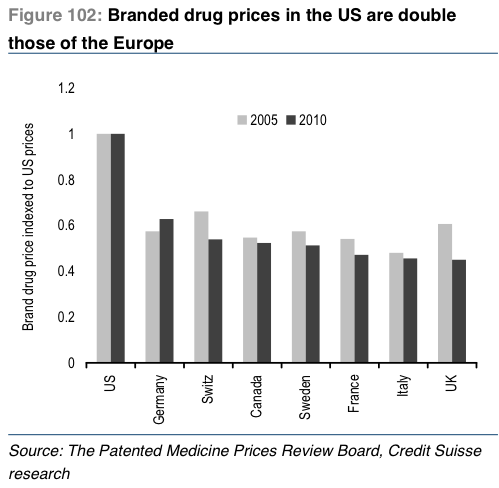 And if you consider that things are generally more expensive in Europe, you might be more intrigued. But many people would argue that we get better healthcare. Now compare these charts with the following one from National Geographic. What’s different about this? First, while you may not be familiar with this type of chart, you can understand the axes. Health care spending per capita is much more concrete than the abstract “percentage of GDP” in the first chart, or the drug pricing simply indexed to US prices in the second. Seeing that we spend over $7,000 each on health care, nearly twice as much as anyone else, puts expenses in terms we can understand. Even better, we can actually see what we get: lower life expectancy than many countries spending much less on healthcare. The chart also provides additional cues with colors and line thickness to indicate the type of healthcare system and how often people see doctors. Most proposals look and sound like the first charts (if we’re lucky). They have data and something to say, but it’s more about the seller than the buyer. When framing value, make sure you do it in terms the prospect can understand and evaluate properly. We’ll get into more details about how to do this in the next post.